Acinetobacter baumannii is a typically short, almost round, rod-shaped (coccobacillus) Gram-negative bacterium. It can be an opportunistic pathogen in humans, affecting people with compromised immune systems, and is becoming increasingly important as a hospital-derived (nosocomial) infection. While other species of the genus Acinetobacter are often found in soil samples (leading to the common misconception that A. baumannii is a soil organism, too), it is almost exclusively isolated from hospital environments. Although occasionally it has been found in environmental soil and water samples,  its natural habitat is still not known. A coccobacillus is a type of bacterium with a shape intermediate between cocci and bacilli. Coccobacilli, then, are very short rods which may be mistaken for cocci. Acinetobacter is a genus of Gram-negative bacteria belonging to the wider class of Gammaproteobacteria. Acinetobacter species are oxidase-negative, exhibit twitching motility, and occur in pairs under magnification. The Moraxellaceae are a family of Gammaproteobacteria, including a few pathogenic species. Others are harmless commensals of mammals and humans or occur in water or soil. The species are mesophilic or psychrotrophic (Psychrobacter). 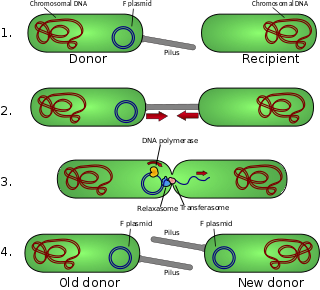 ESKAPE is an acronym encompassing the names of six bacterial pathogens commonly associated with antimicrobial resistance: ESKAPE is an acronym for their names and a reference to their ability to escape the effects of commonly used antibiotics through evolutionarily developed mechanisms, and also because it is a acronym for their names. Enterococcus faecium is a Gram-positive, alpha-hemolytic or non-hemolytic bacterium in the genus Enterococcus. It can be commensal in the gastrointestinal tract of humans and animals, but it may also be pathogenic, causing diseases such as neonatal meningitis or endocarditis. 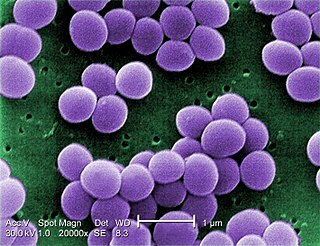 Staphylococcus aureus is a Gram-positive, round-shaped bacterium that is a member of the Firmicutes, and it is a usual member of the microbiota of the body, frequently found in the upper respiratory tract and on the skin. It is often positive for catalase and nitrate reduction and is a facultative anaerobe that can grow without the need for oxygen. Although S. aureus usually acts as a commensal of the human microbiota it can also become an opportunistic pathogen, being a common cause of skin infections including abscesses, respiratory infections such as sinusitis, and food poisoning. Pathogenic strains often promote infections by producing virulence factors such as potent protein toxins, and the expression of a cell-surface protein that binds and inactivates antibodies. The emergence of antibiotic-resistant strains of S. aureus such as methicillin-resistant S. aureus (MRSA) is a worldwide problem in clinical medicine. Despite much research and development, no vaccine for S. aureus has been approved. The Iraq War was a protracted armed conflict that began in 2003 with the invasion of Iraq by a United States-led coalition that overthrew the government of Saddam Hussein. The conflict continued for much of the next decade as an insurgency emerged to oppose the occupying forces and the post-invasion Iraqi government. An estimated 151,000 to 600,000 or more Iraqis were killed in the first three to four years of conflict. The U.S. became re-involved in 2014 at the head of a new coalition; the insurgency and many dimensions of the civil armed conflict continue. The invasion occurred as part of a declared war against international terrorism and its sponsors under the administration of U.S. President George W. Bush following the September 11 terrorist attacks. Type three secretion system is a protein appendage found in several Gram-negative bacteria. Reactive oxygen species (ROS) are chemically reactive chemical species containing oxygen. Examples include peroxides, superoxide, hydroxyl radical, singlet oxygen, and alpha-oxygen. Virulence is a pathogen's or microbe's ability to infect or damage a host. A toxin is a poisonous substance produced within living cells or organisms; synthetic toxicants created by artificial processes are thus excluded. The term was first used by organic chemist Ludwig Brieger (1849–1919), derived from the word toxic. Symptoms of A. baumannii infections are often indistinguishable from other opportunistic infections caused by other opportunistic bacteria - including Klebsiella pneumoniae and Streptococcus pneumoniae. Symptoms of A. baumannii infections in turn range from fevers and chills, rash, confusion and/or altered mental states, pain or burning sensations when urinating, strong urge to urinate frequently, sensitivity to bright light, nausea (with or without vomiting), muscle and chest pains, breathing problems, and cough (with or without yellow, green, or bloody mucus). In some cases, A. baumannii may present no infection or symptoms, as with colonizing an open wound or tracheostomy site. Traumatic injuries, like those from improvised explosive devices, leave large open areas contaminated with debris that are vulnerable to becoming infected with A. baumannii. The logistics of transporting wounded soldiers result in patients visiting several facilities where they may acquire A. baumannii infections. Drug resistance is the reduction in effectiveness of a medication such as an antimicrobial or an antineoplastic in treating a disease or condition. The immune system of an organism is in essence a drug deliverythe system. Meropenem, sold under the brandname Merrem among others, is a broad-spectrum antibiotic used to treat a variety of bacterial infections. Some of these include meningitis, intra-abdominal infection, pneumonia, sepsis, and anthrax. It is given by injection into a vein. Multiple drug resistance (MDR), multidrug resistance or multiresistance is antimicrobial resistance shown by a species of microorganism to multiple antimicrobial drugs. The types most threatening to public health are MDR bacteria that resist multiple antibiotics; other types include MDR viruses, parasites. Recognizing different degrees of MDR, the terms extensively drug resistant (XDR) and pandrug-resistant (PDR) have been introduced. The definitions were published in 2011 in the journal Clinical Microbiology and Infection and are openly accessible. Tigecycline is an antibiotic for a number of bacterial infections. It is a glycylcycline administered intravenously. It was developed in response to the growing rate of antibiotic resistant bacteria such as Staphylococcus aureus, Acinetobacter baumannii, and E. coli. As a tetracycline derivative antibiotic, its structural modifications has expanded its therapeutic activity to include Gram-positive and Gram-negative organisms, including those of multi-drug resistance. Carbapenems are a class of highly effective antibiotic agents commonly used for the treatment of severe or high-risk bacterial infections. This class of antibiotics is usually reserved for known or suspected multidrug-resistant (MDR) bacterial infections. Similar to penicillins and cephalosporins, carbapenems are members of the beta lactam class of antibiotics, which kill bacteria by binding to penicillin-binding proteins, thus inhibiting bacterial cell wall synthesis. However, these agents individually exhibit a broader spectrum of activity compared to most cephalosporins and penicillins. Furthermore, carbapenems are typically unaffected by emerging antibiotic resistance, even to other beta-lactams. 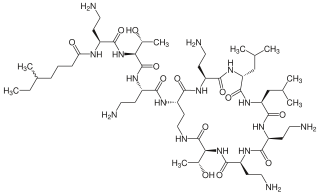 Imipenem is an intravenous β-lactam antibiotic discovered by Merck scientists Burton Christensen, William Leanza, and Kenneth Wildonger in the mid-1970s. Carbapenems are highly resistant to the β-lactamase enzymes produced by many multiple drug-resistant Gram-negative bacteria, thus play a key role in the treatment of infections not readily treated with other antibiotics. Arbekacin (INN) is a semisynthetic aminoglycoside antibiotic. It is primarily used for the treatment of infections caused by multi-resistant bacteria including methicillin-resistant Staphylococcus aureus (MRSA). Arbekacin was originally synthesized from dibekacin in 1973. It has been registered and marketed in Japan since 1990 under the trade name Habekacin. Arbekacin is no longer covered by patent and generic versions of the drug are also available under such trade names as Decontasin and Blubatosine. Multidrug tolerance or antibiotic tolerance is the ability of a disease-causing microorganism to resist being killed by antibiotics or other antimicrobials. It is mechanistically distinct from multidrug resistance: It is not caused by mutant microbes, but rather by microbial cells that exist in a transient, dormant, non-dividing state. Microorganisms that display multidrug tolerance can be bacteria, fungi or parasites. New Delhi metallo-beta-lactamase 1 (NDM-1) is an enzyme that makes bacteria resistant to a broad range of beta-lactam antibiotics. These include the antibiotics of the carbapenem family, which are a mainstay for the treatment of antibiotic-resistant bacterial infections. The gene for NDM-1 is one member of a large gene family that encodes beta-lactamase enzymes called carbapenemases. Bacteria that produce carbapenemases are often referred to in the news media as "superbugs" because infections caused by them are difficult to treat. Such bacteria are usually susceptible only to polymyxins and tigecycline. Multidrug resistant Gram-negative bacteria are a type of Gram-negative bacteria with resistance to multiple antibiotics. They can cause bacteria infections that pose a serious and rapidly emerging threat for hospitalized patients and especially patients in intensive care units. Infections caused by MDR strains are correlated with increased morbidity, mortality, and prolonged hospitalization. Thus, not only do these bacteria pose a threat to global public health, but also create a significant burden to healthcare systems. Carbapenem-resistant Enterobacteriaceae (CRE) or carbapenemase-producing Enterobacteriaceae (CPE) are Gram-negative bacteria that are resistant to the carbapenem class of antibiotics, considered the drugs of last resort for such infections. They are resistant because they produce an enzyme called a carbapenemase that disables the drug molecule. The resistance can vary from moderate to severe. Enterobacteriaceae are common commensals and infectious agents. Experts fear CRE as the new "superbug". The bacteria can kill up to half of patients who get bloodstream infections. 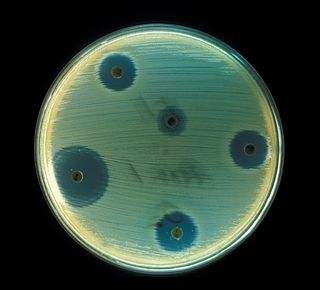 Tom Frieden, former head of the Centers for Disease Control and Prevention has referred to CRE as "nightmare bacteria". Types of CRE are sometimes known as KPC and NDM. KPC and NDM are enzymes that break down carbapenems and make them ineffective. Both of these enzymes, as well as the enzyme VIM have also been reported in Pseudomonas. Plazomicin is a next-generation aminoglycoside ("neoglycoside") antibacterial derived from sisomicin by appending a hydroxy-aminobutyric acid (HABA) substituent at position 1 and a hydroxyethyl substituent at position 6'. Resistance-nodulation-division (RND) family transporters are a category of bacterial efflux pumps, especially identified in Gram-negative bacteria and located in the cytoplasmic membrane, that actively transport substrates. The RND superfamily includes seven families: the heavy metal efflux (HME), the hydrophobe/amphiphile efflux-1, the nodulation factor exporter family (NFE), the SecDF protein-secretion accessory protein family, the hydrophobe/amphiphile efflux-2 family, the eukaryotic sterol homeostasis family, and the hydrophobe/amphiphile efflux-3 family. These RND systems are involved in maintaining homeostasis of the cell, removal of toxic compounds, and export of virulence determinants. They have a broad substrate spectrum and can lead to the diminished activity of unrelated drug classes if over-expressed. The first reports of drug resistant bacterial infections were reported in the 1940s after the first mass production of antibiotics. Most of the RND superfamily transport systems are made of large polypeptide chains. RND proteins exist primarily in gram-negative bacteria but can also be found in gram-positive bacteria, archaea, and eukaryotes. ↑ Parte, A.C. "Acinetobacter". www.bacterio.net. ↑ Antunes, LCS; Visca, P; Towner, KJ (2014). "Acinetobacter baumannii: evolution of a global pathogen". Pathogens and Disease. 71 (3): 292–301. doi:10.1111/2049-632X.12125. PMID 24376225. 1 2 Yeom, J; Shin, JH; Yang, JY; Kim, J; Hwang, GS (2013). "(1)H NMR-Based Metabolite Profiling of Planktonic and Biofilm Cells in Acinetobacter baumannii 1656-2". PLoS ONE. 8 (3): e57730. Bibcode:2013PLoSO...857730Y. doi:10.1371/journal.pone.0057730. PMC 3590295 . PMID 23483923. 1 2 McQueary, CN; Kirkup, BC; Si, Y; Barlow, M; Actis, LA; Craft, DW; Zurawski, DV (June 2012). "Extracellular stress and lipopolysaccharide modulate Acinetobacter baumannii surface-associated motility". Journal of Microbiology. 50 (3): 434–43. doi:10.1007/s12275-012-1555-1. PMID 22752907. ↑ Garrity, G., ed. (2000). "Pts. 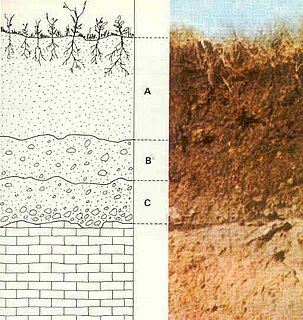 A & B: The Proteobacteria". Bergey's Manual of Systematic Bacteriology. 2 (2nd ed., rev. ed.). New York: Springer. p. 454. ISBN 978-0-387-95040-2. 1 2 O'Shea, MK (May 2012). "Acinetobacter in modern warfare". International Journal of Antimicrobial Agents. 39 (5): 363–75. doi:10.1016/j.ijantimicag.2012.01.018. PMID 22459899. ↑ Gerner-Smidt, P (October 1992). "Ribotyping of the Acinetobacter calcoaceticus-Acinetobacter baumannii complex". Journal of Clinical Microbiology. 30 (10): 2680–5. PMC 270498 . PMID 1383266. ↑ Rice, LB (15 April 2008). "Federal funding for the study of antimicrobial resistance in nosocomial pathogens: no ESKAPE". The Journal of Infectious Diseases. 197 (8): 1079–81. doi:10.1086/533452. PMID 18419525. ↑ Drummond, Katie. 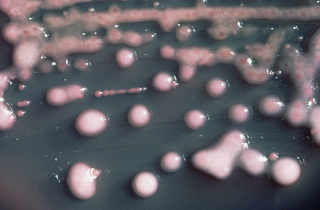 "Pentagon to Troop-Killing Superbugs: Resistance Is Futile". Wired.com. Condé Nast. Retrieved 8 April 2013. ↑ Choi, CH; Lee, JS; Lee, YC; Park, TI; Lee, JC (10 December 2008). "Acinetobacter baumannii invades epithelial cells and outer membrane protein A mediates interactions with epithelial cells". BMC Microbiology. 8: 216. doi:10.1186/1471-2180-8-216. PMC 2615016 . PMID 19068136. ↑ Lee, JS; Choi, CH; Kim, JW; Lee, JC (June 2010). "Acinetobacter baumannii outer membrane protein A induces dendritic cell death through mitochondrial targeting". Journal of Microbiology. 48 (3): 387–92. doi:10.1007/s12275-010-0155-1. PMID 20571958. ↑ Seputiene, V.; Povilonis, J.; Suziedeliene, E. (30 January 2012). "Novel Variants of AbaR Resistance Islands with a Common Backbone in Acinetobacter baumannii Isolates of European Clone II". Antimicrobial Agents and Chemotherapy. 56 (4): 1969–1973. doi:10.1128/AAC.05678-11. PMC 3318354 . PMID 22290980. ↑ Post, V; White, PA; Hall, RM (June 2010). "Evolution of AbaR-type genomic resistance islands in multiply antibiotic-resistant Acinetobacter baumannii". The Journal of Antimicrobial Chemotherapy. 65 (6): 1162–70. doi:10.1093/jac/dkq095. PMID 20375036. ↑ Magnet, S; Courvalin, P; Lambert, T (December 2001). "Resistance-nodulation-cell division-type efflux pump involved in aminoglycoside resistance in Acinetobacter baumannii strain BM4454". Antimicrobial Agents and Chemotherapy. 45 (12): 3375–80. doi:10.1128/aac.45.12.3375-3380.2001. PMC 90840 . PMID 11709311. ↑ Chau, SL; Chu, YW; Houang, ET (October 2004). "Novel resistance-nodulation-cell division efflux system AdeDE in Acinetobacter genomic DNA group 3". Antimicrobial Agents and Chemotherapy. 48 (10): 4054–5. doi:10.1128/aac.48.10.4054-4055.2004. PMC 521926 . PMID 15388479. ↑ Sharma, Rajnikant; Arya, Sankalp; Patil, Supriya Deepak; Sharma, Atin; Jain, Pradeep Kumar; Navani, Naveen Kumar; Pathania, Ranjana (2014-01-01). "Identification of novel regulatory small RNAs in Acinetobacter baumannii". PLoS One. 9 (4): e93833. Bibcode:2014PLoSO...993833S. doi:10.1371/journal.pone.0093833. ISSN 1932-6203. PMC 3976366 . PMID 24705412. ↑ Higgins, PG; Pérez-Llarena, FJ; Zander, E; Fernández, A; Bou, G; Seifert, H (25 February 2013). "OXA-235, a novel Class D Beta-Lactamase Involved in Resistance to Carbapenems in Acinetobacter baumannii". Antimicrobial Agents and Chemotherapy. 57 (5): 2121–6. doi:10.1128/AAC.02413-12. PMC 3632948 . PMID 23439638. ↑ Espinal, P; Martí, S; Vila, J (January 2012). "Effect of biofilm formation on the survival of Acinetobacter baumannii on dry surfaces". The Journal of Hospital Infection. 80 (1): 56–60. doi:10.1016/j.jhin.2011.08.013. PMID 21975219. ↑ Tomaras, AP; Dorsey, CW; Edelmann, RE; Actis, LA (December 2003). "Attachment to and biofilm formation on abiotic surfaces by Acinetobacter baumannii: involvement of a novel chaperone-usher pili assembly system". Microbiology. 149 (Pt 12): 3473–84. doi:10.1099/mic.0.26541-0. PMID 14663080. ↑ Worthington, RJ; Richards, JJ; Melander, C (7 October 2012). "Small molecule control of bacterial biofilms". Organic & Biomolecular Chemistry. 10 (37): 7457–74. doi:10.1039/c2ob25835h. PMC 3431441 . PMID 22733439. 1 2 "What Is Acinetobacter Baumannii?". Everyday Health. Retrieved 18 April 2017. ↑ Su, CH; Wang, JT; Hsiung, CA; Chien, LJ; et al. (2012). "Increase of carbapenem-resistant Acinetobacter baumannii infection in acute care hospitals in Taiwan: Association with hospital antimicrobial usage". PLOS ONE . 7 (5): e37788. Bibcode:2012PLoSO...737788S. doi:10.1371/journal.pone.0037788. PMC 3357347 . PMID 22629456. ↑ Abbo, A; Navon-Venezia, S; Hammer-Muntz, O; Krichali, T; et al. (January 2005). "Multidrug-resistant Acinetobacter baumannii". Emerging Infectious Diseases . 11 (1): 22–9. doi:10.3201/eid1101.040001. PMC 3294361 . PMID 15705318. ↑ Spapen, H; Jacobs, R; Van Gorp, V; Troubleyn, J; et al. (25 May 2011). "Renal and neurological side effects of colistin in critically ill patients". Annals of Intensive Care. 1 (1): 14. doi:10.1186/2110-5820-1-14. PMC 3224475 . PMID 21906345. ↑ "Acinetobacter in Healthcare Settings". CDC. Retrieved 8 April 2013. ↑ "He was dying. Antibiotics weren't working. Then doctors tried a forgotten treatment". Mother Jones. Retrieved 2018-05-17. ↑ "Army Medical Logistics" (PDF). FM 4-02.1. United States. Archived from the original (PDF) on 2013-03-23. Retrieved April 8, 2013. ↑ Meghoo, CA; Dennis, JW; Tuman, C; Fang, R (May 2012). "Diagnosis and management of evacuated casualties with cervical vascular injuries resulting from combat-related explosive blasts". Journal of Vascular Surgery. 55 (5): 1329–36, discussion 1336–7. doi:10.1016/j.jvs.2011.11.125. PMID 22325667. ↑ Murray, CK (March 2008). "Epidemiology of infections associated with combat-related injuries in Iraq and Afghanistan". The Journal of Trauma. 64 (3 Suppl): S232–8. doi:10.1097/ta.0b013e318163c3f5. PMID 18316967. ↑ "Acinetobacter in Healthcare Settings". Centers for Disease Control and Prevention. US Department of Health and Human Services. Retrieved 18 April 2017. ↑ Jones, A; Morgan, D; Walsh, A; Turton, J; Livermore, D; Pitt, T; Green, A; Gill, M; Mortiboy, D (June 2006). "Importation of multidrug-resistant Acinetobacter spp infections with casualties from Iraq". The Lancet Infectious Diseases. 6 (6): 317–8. doi:10.1016/S1473-3099(06)70471-6. PMID 16728314. ↑ Dijkshoorn, L; Nemec, A; Seifert, H (December 2007). "An increasing threat in hospitals: multidrug-resistant Acinetobacter baumannii". Nature Reviews Microbiology. 5 (12): 939–51. doi:10.1038/nrmicro1789. PMID 18007677. ↑ "Acinetobacter in Healthcare Settings - HAI - CDC". www.cdc.gov. Retrieved 2 April 2018. ↑ Multidrug-Resistant Acinetobacter baumannii (MDRAB).” WHO Western Pacific Region, WPRO | WHO Western Pacific Region, 1 Nov. 2010, www.wpro.who.int/mediacentre/factsheets/fs_20101102/en/. ↑ Koulenti, D; Lisboa, T; Brun-Buisson, C; Krueger, W; Macor, A; Sole-Violan, J; Diaz, E; Topeli, A; DeWaele, J; Carneiro, A; Martin-Loeches, I; Armaganidis, A; Rello, J (August 2009). EU-VAP/CAP Study, Group. "Spectrum of practice in the diagnosis of nosocomial pneumonia in patients requiring mechanical ventilation in European intensive care units". Critical Care Medicine. 37 (8): 2360–8. doi:10.1097/ccm.0b013e3181a037ac. PMID 19531951. ↑ Ng, J; Gosbell, IB; Kelly, JA; Boyle, MJ; Ferguson, JK (November 2006). "Cure of multiresistant Acinetobacter baumannii central nervous system infections with intraventricular or intrathecal colistin: case series and literature review". The Journal of Antimicrobial Chemotherapy. 58 (5): 1078–81. doi:10.1093/jac/dkl347. PMID 16916866. ↑ Farrugia, DN; Elbourne, LD; Hassan, KA; Eijkelkamp, BA; Tetu, SG; Brown, MH; Shah, BS; Peleg, AY; Mabbutt, BC; Paulsen, IT (2013). "The Complete Genome and Phenome of a Community-Acquired Acinetobacter baumannii". PLoS ONE. 8 (3): e58628. Bibcode:2013PLoSO...858628F. doi:10.1371/journal.pone.0058628. PMC 3602452 . PMID 23527001. ↑ Werneck, JS; Picão, RC; Carvalhaes, CG; Cardoso, JP; Gales, AC (February 2011). "OXA-72-producing Acinetobacter baumannii in Brazil: a case report". The Journal of Antimicrobial Chemotherapy. 66 (2): 452–4. doi:10.1093/jac/dkq462. PMID 21131320. ↑ Martins, N; Martins, IS; de Freitas, WV; de Matos, JA; Magalhães, AC; Girão, VB; Dias, RC; de Souza, TC; Pellegrino, FL; Costa, LD; Boasquevisque, CH; Nouér, SA; Riley, LW; Santoro-Lopes, G; Moreira, BM (June 2012). "Severe infection in a lung transplant recipient caused by donor-transmitted carbapenem-resistant Acinetobacter baumannii". Transplant Infectious Disease. 14 (3): 316–20. doi:10.1111/j.1399-3062.2011.00701.x. PMC 3307813 . PMID 22168176. ↑ Superti, SV; Martins Dde, S; Caierão, J; Soares Fda, S; Prochnow, T; Zavascki, AP (March–April 2009). "Indications of carbapenem resistance evolution through heteroresistance as an intermediate stage in Acinetobacter baumannii after carbapenem administration". Revista do Instituto de Medicina Tropical de Sao Paulo. 51 (2): 111–3. doi:10.1590/s0036-46652009000200010. PMID 19390741. ↑ Gionco, B; Pelayo, JS; Venancio, EJ; Cayô, R; Gales, AC; Carrara-Marroni, FE (October 2012). "Detection of OXA-231, a new variant of blaOXA-143, in Acinetobacter baumannii from Brazil: a case report". The Journal of Antimicrobial Chemotherapy. 67 (10): 2531–2. doi:10.1093/jac/dks223. PMID 22736746. ↑ Zhao, WS; Liu, GY; Mi, ZH; Zhang, F (March 2011). "Coexistence of blaOXA-23 with armA and novel gyrA mutation in a pandrug-resistant Acinetobacter baumannii isolate from the blood of a patient with haematological disease in China". The Journal of Hospital Infection. 77 (3): 278–9. doi:10.1016/j.jhin.2010.11.006. PMID 21281989. ↑ Xiao, SC; Zhu, SH; Xia, ZF; Ma, B; Cheng, DS (November 2009). "Successful treatment of a critical burn patient with obstinate hyperglycemia and septic shock from pan-drug-resistant strains". Medical Science Monitor. 15 (11): CS163–5. PMID 19865060. ↑ Wu, YC; Hsieh, TC; Sun, SS; Wang, CH; Yen, KY; Lin, YY; Kao, CH (November 2009). "Unexpected cloud-like lesion on gallium-67 scintigraphy: detection of subcutaneous abscess underneath the skin with normal appearance in a comatose patient in an intensive care setting". The American Journal of the Medical Sciences. 338 (5): 388. doi:10.1097/maj.0b013e3181a6dd36. PMID 19770790. ↑ Duan, X; Yang, L; Xia, P (March 2010). "Septic arthritis of the knee caused by antibiotic-resistant Acinetobacter baumannii in a gout patient: a rare case report". Archives of Orthopaedic and Trauma Surgery. 130 (3): 381–4. doi:10.1007/s00402-009-0958-x. PMID 19707778. 1 2 Wagner, JA; Nenoff, P; Handrick, W; Renner, R; Simon, J; Treudler, R (February 2011). "Necrotizing fasciitis caused by Acinetobacter baumannii : A case report". Der Hautarzt; Zeitschrift für Dermatologie, Venerologie, und Verwandte Gebiete (in German). 62 (2): 128–30. doi:10.1007/s00105-010-1962-3. PMID 20835812. ↑ Aivazova, V; Kainer, F; Friese, K; Mylonas, I (January 2010). "Acinetobacter baumannii infection during pregnancy and puerperium". Archives of Gynecology and Obstetrics. 281 (1): 171–4. doi:10.1007/s00404-009-1107-z. PMID 19462176. ↑ Schulte, B; Goerke, C; Weyrich, P; Gröbner, S; Bahrs, C; Wolz, C; Autenrieth, IB; Borgmann, S (December 2005). "Clonal spread of meropenem-resistant Acinetobacter baumannii strains in hospitals in the Mediterranean region and transmission to South-west Germany". The Journal of Hospital Infection. 61 (4): 356–7. doi:10.1016/j.jhin.2005.05.009. PMID 16213625. ↑ Piparsania, S; Rajput, N; Bhatambare, G (September–October 2012). "Intraventricular polymyxin B for the treatment of neonatal meningo-ventriculitis caused by multi-resistant Acinetobacter baumannii--case report and review of literature". The Turkish Journal of Pediatrics . 54 (5): 548–54. PMID 23427525. ↑ John, TM; Jacob, CN; Ittycheria, CC; George, AM; Jacob, AG; Subramaniyam, S; Puthiyaveettil, J; Jayaprakash, R (March 2012). "Macrophage activation syndrome following Acinetobacter baumannii sepsis". International Journal of Infectious Diseases. 16 (3): e223–4. doi:10.1016/j.ijid.2011.12.002. PMID 22285540. ↑ Sharma, A; Shariff, M; Thukral, SS; Shah, A (October 2005). "Chronic community-acquired Acinetobacter pneumonia that responded slowly to rifampicin in the anti-tuberculous regime". The Journal of Infection. 51 (3): e149–52. doi:10.1016/j.jinf.2004.12.003. PMID 16230195. ↑ Jeong, HL; Yeom, JS; Park, JS; Seo, JH; Park, ES; Lim, JY; Park, CH; Woo, HO; Youn, HS (July–August 2011). "Acinetobacter baumannii isolation in cerebrospinal fluid in a febrile neonate". The Turkish Journal of Pediatrics. 53 (4): 445–7. PMID 21980849. ↑ Hong, KB; Oh, HS; Song, JS; Lim, JH; Kang, DK; Son, IS; Park, JD; Kim, EC; Lee, HJ; Choi, EH (July 2012). "Investigation and control of an outbreak of imipenem-resistant Acinetobacter baumannii Infection in a Pediatric Intensive Care Unit". The Pediatric Infectious Disease Journal. 31 (7): 685–90. doi:10.1097/inf.0b013e318256f3e6. PMID 22466324. ↑ Lee, YK; Kim, JK; Oh, SE; Lee, J; Noh, JW (December 2009). "Successful antibiotic lock therapy in patients with refractory peritonitis". Clinical Nephrology. 72 (6): 488–91. doi:10.5414/cnp72488. PMID 19954727. ↑ Lee, SY; Lee, JW; Jeong, DC; Chung, SY; Chung, DS; Kang, JH (August 2008). "Multidrug-resistant Acinetobacter meningitis in a 3-year-old boy treated with i.v. colistin". Pediatrics International. 50 (4): 584–5. doi:10.1111/j.1442-200x.2008.02677.x. PMID 18937759. ↑ Adams, D; Yee, L; Rimmer, JA; Williams, R; Martin, H; Ovington, C (February 2011). "Investigation and management of an A. Baumannii outbreak in ICU". British Journal of Nursing. 20 (3): 140, 142, 144–7. doi:10.12968/bjon.2011.20.3.140. PMID 21378633. ↑ Pencavel, TD; Singh-Ranger, G; Crinnion, JN (May 2006). "Conservative treatment of an early aortic graft infection due to Acinetobacter baumanii". Annals of Vascular Surgery. 20 (3): 415–7. doi:10.1007/s10016-006-9030-2. PMID 16602028. ↑ Gusten, WM; Hansen, EA; Cunha, BA (January–February 2002). "Acinetobacter baumannii pseudomeningitis". Heart & Lung. 31 (1): 76–8. doi:10.1067/mhl.2002.120258. PMID 11805753. ↑ Fitzpatrick, MA; Esterly, JS; Postelnick, MJ; Sutton, SH (July–August 2012). "Successful treatment of extensively drug-resistant Acinetobacter baumannii peritoneal dialysis peritonitis with intraperitoneal polymyxin B and ampicillin-sulbactam". Annals of Pharmacotherapy. 46 (7–8): e17. doi:10.1345/aph.1r086. PMID 22811349. ↑ Patel, JA; Pacheco, SM; Postelnick, M; Sutton, S (15 August 2011). "Prolonged triple therapy for persistent multidrug-resistant Acinetobacter baumannii ventriculitis". American Journal of Health-System Pharmacy. 68 (16): 1527–31. doi:10.2146/ajhp100234. PMID 21817084. ↑ Sullivan, DR; Shields, J; Netzer, G (June 2010). "Fatal case of multi-drug resistant Acinetobacter baumannii necrotizing fasciitis". The American Surgeon. 76 (6): 651–3. PMID 20583528. ↑ Tjoa E, Moehario LH, Rukmana A, Rohsiswatmo R (2013). "Acinetobacter baumannii: Role in Blood Stream Infection in Neonatal Unit, Cipto Mangunkusumo Hospital, Jakarta, Indonesia". International Journal of Microbiology. 2013: 180763. doi:10.1155/2013/180763. PMC 3830835 . PMID 24288538.